In 1913, the British textiles industry achieved its highest output – 7 billion square yards of cloth were produced. From then on output fell and the familiar story of post-industrial decline set in. From the heady days of 'peak shirt' the mills of Lancashire declined in importance. They became reminders of a bygone era when the UK produced enough fabric to cover the whole of Norfolk in one year. In 1913 weaving wasn’t regarded as a ‘traditional industry’ – it was cutting edge. Innovative textile manufacturers were combining with military engineers to create fabrics for use in the most unusual technology of the day: on aeroplanes and airships. Visualising and then producing applications for textiles have always required the combination of artistic and scientific imaginations. Sixteen years ago, a graduate from University of Central England (now Birmingham City University), with a passion for fashion and textile design was encouraged to research textile construction on the Masters programme at Central Saint Martins College of Art and Design (now Central Saint Martins in London). Here she developed new applications for textiles for use in the field of special needs teaching, her challenge was to rethink the function of fabric. Her goal was to produce eye-catching designs on engaging and surprising products that never existed before. As the enormity of her task became more tangible Asha Peta Thompson received a research grant from Brunel University’s Design For Life initiative. Here she met the business partner who exactly complimented her skill set. Asha describes herself as ‘arty, never sciency’, Dr Stan Swallow, formerly of Brunel University, is sciency – not arty. Stan’s background in electronics and sensing technology fitted Asha’s need to prove that fabrics could do more than please the eye. They could, for example, conduct electricity, remember things, broadcast and interact with the user. Their concept of interactive, powered-up fabrics was revolutionary. Perhaps what Asha and Stan were less certain about was a more fundamental question – what was it for? When it comes to clinching a deal - patent protection is the be all and end all. We have a lot of know-how, networks and design rights. But in terms of the deal, the only part that is essential are the patents. Intelligent Textiles have always maintained and developed their patent portfolio. Today Intelligent Textiles owns patents in a dozen countries and spends as much as £50,000 on IP related issues every year. In short – intelligent textiles is intellectual property. Intelligent Textiles’ journey from the abstract world of a university to the front line of a war zone reveals something common to both the arty and the sciency imagination: a spirit of adventure. The company’s first partnership was with Australian Wool Innovation, but their efforts to engage high street retailers in wired up clothing and textile products seemed an uphill struggle. It wasn’t until a contact enabled Intelligent Textiles to pitch to the Canadian military that they realised about the great need for lightweight, hard-wearing, smart fabrics in the uniformed professions. Asha and Stan today with the third member of their team: the soldier system. On his return from Association of the US Army exhibition this October, Stan explains that the global size of the soldier system market for the next five years has been estimated at $27 billion. 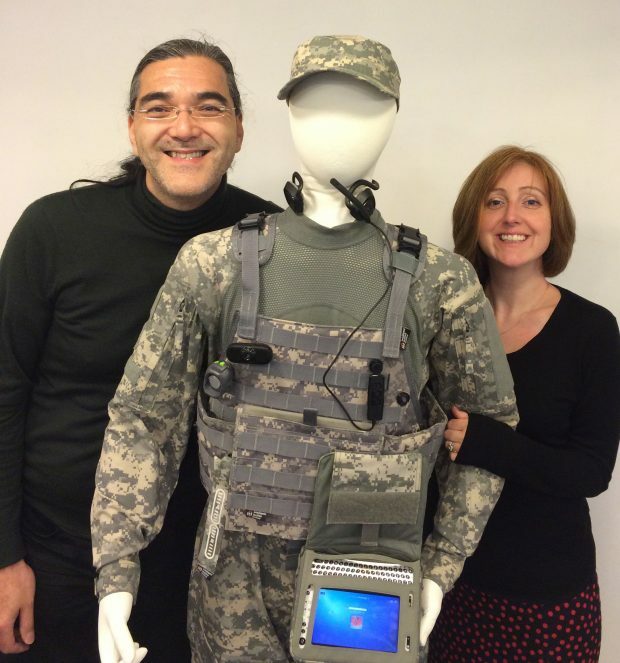 The need to rationalise the weight and design of a modern soldier’s electronic equipment means that a uniform has become a complex suite of technologies linked through clothing. Intelligent Textiles, has found its niche and it turns out to be one of almost unimaginable size with almost infinite possibilities. Asha confirms that a partnership with BAE Systems to design the Broadsword® soldier systems for the US military has been agreed. She is optimistic about the company’s future relationship with the British Army who will be developing further soldier worn systems as well as a variety of militaries across the world. Of course, a great design still needs to be transformed into a world beating product. Intelligent Textiles’ fabrics are produced by manufacturers in Lancashire. The British textile industry is smarter than you may think.